If you’re reading this article I’m sure you’ve heard that rest is just as important as training. Some athletes keep track of resting HR, HRV, sleep, mood and other indicators of recovery to help with this aspect of training. And most of us have a feel for when we need to take some rest during a training block—though it can be difficult to listen to these signs! In my previous article I talked about returning to normalcy after a big block of training and settling in to a sustainable routine. Today, I want to discuss recovering from stage races, especially when you have more racing left in the season. The first half of my season was centered around three races in a roughly five-week stretch of time. Tour of the Gila and Amgen Tour of California were my main targets, along with Redlands Cycling Classic—which landed smack dab in the middle of those two events. Step one in being able to maintain “peak form” for this stretch of time was achieving a high level of fitness and building “CTL” steadily in the months leading up to April. My previous articles discuss more of the early season training camps and aerobic base building that got my fitness to where it needed to be. The next part of the equation was resting and tapering properly to be fit, fast, and fresh for each of these events. Tour of the Gila was the first objective on the list. Being a high-altitude race, Gila comes with some specific training and resting demands. I spent much of my time in the weeks leading up to the race above 7000 ft. Altitude has a strong effect on my body, so after talking with my coach, David Wenger at Durata Training, we decided to take a cautious approach and went for less volume and intensity during this time. We wanted to make sure I was allowing myself time to adapt to that stimulus in time for the race. Another reason for the reduction in training load was the fact that I needed to maintain my form for another month after Gila. This approach did end up with some consequences—I started Gila with some “overly fresh” legs and an elevated HR that comes along with that. I struggled a bit on the finishing climb to Mogollon day one and lost some valuable GC time that I never managed to pull back. However, I was able to get better and better as the week went on, taking 2nd in the TT, winning the last stage, and finishing 2nd overall. Looking back, there might be some small changes I would make, but overall this race was almost perfect. Next up was recovery and fine tuning for Redlands and Tour of California. I felt good coming out of Gila and knew I would bounce back quickly, but again I had to think further down the road to the Tour of California as well. There were about 10 days between Gila and Redlands, which sounds like a decent chunk of time, but when you factor in travel, recovery days, and an opener day, there really isn’t a ton of time to train. I typically train in 3-4 day blocks with the last day being a recovery day. It’s a bit easier to have a feel for how your body is responding to the load of training when you have an easy day every few days to check in. So after two very easy days and one 2.5 hour easy endurance day, I knew I needed to get a hard day in to keep my body from shutting down. This came in the form of a 4hr day with 4x8min sets of 40/20s and a set of 6 sprints with 1:45 of tempo between. The idea behind this ride is to touch a bit of every training zone and to prepare the legs for sea level. I knew going into Redlands that the high power demands of sea level would be a challenge despite trying to mimic some of those effects in training in Colorado. It’s always a bit of a roll of the dice when racing in new conditions, but I knew that whatever my results it would be perfect preparation for The Tour of California. I definitely had some heavy-feeling legs during high-power attacks on the first long mountain stage, but by the time we reached the very punchy sunset loop stage on Sunday, my legs had come around nicely. The setup for Redlands is such that there is a lot of intensity and race speed without a huge amount of volume, which lends itself perfectly as a lead in for Tour of California. I managed to finish 4th on each stage of the race and in GC, which was a bit of a mixed bag of emotions. I was hoping for a bit more on the GC days, but I was pleasantly surprised with my punchiness in the shorter efforts like the criterium and uphill sprint on the Highland Circuit race (where I set my 1 min power record for the year). These were good signs ahead of California and I was confident that my legs and lungs were up for the challenge. Last but not least came the Amgen Tour of California (ATOC), which has become biggest road cycling event in North America, given its recently updated UCI WorldTour status. Performing well meant one more week of balancing rest and staying open. Even though Redlands was very close to the start of this years ATOC I opted to fly home for a few nights in my own bed. With only six days between these two events and two of those being travel days, this time flew by. For recover after Redlands I took a similar approach as post-Gila but with less intensity, given the shorter time frame and the demands of Redlands. After two super easy days followed by an easy 2.5 hour endurance day I did my one real workout for the week, which consisted of 30 minutes of tempo with surges on some big rolling hills. I then did a 90 minute hard group ride in town and a bit of zone 2 time to hit the 4 hour mark. I felt really good on this ride and took the next two days into ATOC nice and easy. I even skipped my normal opener efforts the day before, since I knew stage one would be a mellow one for me, with the important big mountain stages to come. Maintaining peak form for five weeks is no easy challenge and requires fine tuning and listening to your body. Knowing when you need to push and when you need to back off are crucial during key periods of racing and recovering. So is having good communication with your coach. I realize most athletes aren’t taking on this heavy a load of stage racing, but the same principles apply for weekend warriors and developing racers. A month-long stretch of crits and/or road races on the weekend require mid-week rest and recovery, followed by some intensity and a little volume to maintain fitness and stay opened up! Thanks for reading and I hope my experiences can help you feel your best for the next race. Editor’s note: Gavin finished an impressive 11th in the GC at ATOC this year. The post UHC’s Gavin Mannion: Race, Recover, Repeat appeared first on TrainingPeaks. 40/20 workouts are intervals designed around 40-seconds of work followed by 20-seconds of rest or active recovery. They fall under the umbrella of Tabata workouts (named after Dr. Izumi Tabata) and are often referred to as HIIT (high intensity interval training). Over the years, many different work-to-rest ratios have been used for certain workouts, such as 20-seconds of work/10-seconds of rest, 30-seconds of work/30seconds of rest, 40-seconds of work/20-seconds of rest, etc. All of the work on similar principals. During the intense 40-seconds of work, you will be close to or at your lactate threshold, i.e. the point at which your muscles begin producing lactate as a byproduct of anaerobic respiration. When you produce lactate at a faster rate than it can be utilized, it’s pretty much game over for your performance. Your muscles’ ability to contract becomes significantly diminished and you will be forced to slow to a crawl, or even stop all together, until lactate can be cleared. Therefore, we want to teach your body to utilize and clear lactate as quickly as possible, which is why you’ll want to take short rests after each interval. During the 20-seconds of active recovery/rest, your heart rate will drop, which clears the lactate and allows you to make another effort. Over time, your body will become efficient at clearing lactate, and you will be able to hold a faster pace for a longer period of time. As you can imagine, 40/20 workouts can become quite intense. So, these workouts are recommended for well-trained athletes with a solid foundation of fitness and strength. Let’s take a look at some 40/20 workouts that will train your body to become more efficient, faster and stronger. This workout is ideal for the track or flat terrain. Be sure you are well-fueled with carbohydrates, such as an energy bar (plus 20-30oz water), prior to starting this workout. Let’s say your goal is to run 6:00/mile for a 5k. Begin with a 2-3 mile gradual warm up run. Then it’s time to begin the 40/20 portion of the workout. Run 40-seconds at your goal 5k pace (6:00/mile) and then jog 20-seconds at :30/mile slower than goal pace (6:30/mile). At your first attempt for this workout, continue the 40/20 for 1 mile and then over time, gradually build up to 3-4 miles. Following the workout, warm down with an easy 1-mile jog. The next phase of this workout is to press the pace a bit more so that we can continue to raise the fitness ceiling. Once you master the workout above, try the next one: Begin with a 2-3 mile gradual warm up run. Then run 40-seconds at :10/mile faster than your 5k goal pace (5:50/mile) and then jog 20-seconds at :20-:30/mile slower than goal pace (6:20-6:30/mile). Gradually and progressively build up to 3-4 miles of the 40/20. Following the workout, warm down with an easy 1-mile jog. For the more advanced runner, these workouts can be done more frequently, every 7-10 days. For those runners new to this type of intensity, performing this workout once every 3-4 weeks is ideal. This workout is ideal for the stationary trainer. Again, be sure you are rested and well-fueled with carbohydrates, such as an energy bar (plus 20-30oz water), prior to starting this workout. Let’s say your goal is to hold 300 Watts for a 20k Time Trial. Begin with a 30-minute gradual warm up. Then ride 40-seconds (90+ rpm) at your TT goal (300W) followed by 20-seconds at 200W. Continue this 40/20 pattern for 10 minutes. And over time, gradually increase the 40/20 to 30-minutes. Following the workout, pedal easy for 10-minutes to warm down. Once you have mastered the above workout, let’s move into phase 2. Begin with a 30-minute gradual warm up. Then ride 40-seconds (90+ rpm) 10W more than your TT goal (310W) followed by 20-seconds at 210W. Continue this 40/20 pattern for 10 minutes. Over time, gradually increase the 40/20 to 30-minutes. Following the workout, pedal easy for 10-minutes to warm down. NOTE: When your total workout time reaches 50+ minutes, be sure to fuel your body during the ride with 1 bottle containing 150-250 calories of fluid replacement drink. Workouts like this can be performed once every 10-14 days. Prior to starting this workout, be sure to foam roll and stretch 10-15 minutes. Begin with the push-ups and perform as many reps as you can in 40-seconds (chest to the floor and full elbow extension on each rep), then rest for 20-seconds. Continue this 40/20 for 3-minutes. Next, perform as many sit-ups as you can in 40-seconds followed by 20-seconds of rest. Continue this 40/20 for 3-minutes. Following the sit-ups, perform as many reps body weight squats (full squat, keep heels on the ground, knee is at 90°, quads parallel with the ground) that you can perform in 40-seconds followed by 20-seconds of rest. Continue this 40/20 for 3-minutes. Close out your strength & conditioning workout with jump rope. Perform as many reps as you can in 40-seconds and then rest for 20-seconds. Continue this 40/20 for 3 minutes. Over time, gradually and progressively build up to 7-minutes for each exercise (28-minutes total workout time). Want to add even more spice to the sauce? Perform the 40/20 Strength & Conditioning workout and then immediately after, knock out the Running or Cycling 40/20 workout. Strength work prior to cardiovascular work is ideal. Yes, you will feel the fatigue during your run and cycling workout—this is by design. We are stretching the comfort zone and teaching the body to perform and perform well while fatigued (we do not want race day to be the toughest thing we do!) In addition, performing the run/cycling workout following the strength work will help to minimize muscular soreness that can be a byproduct of the 40/20 strength workout. The post Work-to-Rest Ratio: The Benefits of 40/20 Workouts appeared first on TrainingPeaks. Sooner or later, it’s bound to happen: you’ll have a bad race or a DNF. You’ll get to the finish line area and feel overwhelmed—disappointed, frustrated, maybe even angry. But after a string of good results, a bad race can be crushing. So how do we move on from a poor performance? Working through these five questions will help you move forward with a clear understanding of why it happened and, more importantly, how you can move forward. In the heat of the moment, it’s easy to let yourself think, “Nothing went right; it was a total mess.” Most of the time, though, that’s untrue! Once you’ve had some time to think it over, after an appropriate “cooling off period, so to speak, ask yourself: Did you follow your nutrition plan? Did you stick with the pacing plan you and your coach discussed? Did you feel strong longer in the race than you have before? Did you run the furthest you ever have? In other words, start by identifying the positive outcomes of your race. This will help you distill out the bigger-picture good vs. bad. We need to remember that we learn from failure—experience is what helps us improve. If we don’t understand what happened during a bad race, we can’t fully enjoy our success. What did you do to make it right? What did your crew do to help this go smoothly? What did your coach do that helped you feel good? How did your preparation (workouts, runs or rides) prepare you for the course? What are the controllable pieces that did you manage well? Maybe you followed your training plan to the letter, nailed your nutrition, and you had your most consistent pacing to date. Make notes of how you felt and why so you can replicate for future races. The past is the best teacher for our future. Don’t just look at a bad race as the sum of a whole; look at the pieces. What was not quite right? We’ve established what went well, so now let’s look at what could have been improved. Avoid blanket statements like, “Everything,” or even, “My entire nutrition/pacing/training plan was wrong.” If those things felt off, what specifically about them didn’t feel great? This is a great place to fold in the emotional side of your training. How did you feel when things started to go poorly? What actions (or inactions) precipitated these feelings? Identifying these feelings—even the seemingly minor twinges or grumblings—can provide insight to improve your training plan for next time. For example, does that little twinge in your throat mean you’re thirsty? How about feeling a little grumpy—should you eat? Dissect your inner dialogue here so you can translate better in the future. How did you imagine this playing out?. How and when did any problems/mistakes/mishaps direct you away from your ideal race plan? Did you miss your bottle at aid station 3 in the marathon? Did you not feel confident on the climb where you’d planned to throw down the hammer? Did an opponent who you never thought would pass you catch you in the final miles of the race? Did you develop a blister after swapping into new shoes at mile 50 when you were hoping they’d feel comfortable and fresh? Define where you diverged from your ideal state so you can see it coming in the future. Here’s where you can move forward and set your future intentions. This part is great to discuss with your coach, friends, and fellow athletes. Should you plan to take more salt to avoid the stomach cramps that slowed you enough to miss the cutoff? Do you need to drink more during hot races? Do you need to eat at the start of the climb? Use these questions to set your intentions—and make them known: “I will eat more before I start a big climb in a race, which will help me feel confident about my ascent. Then, actually incorporate those steps into your training. There are times when a race goes poorly because of conditions beyond your control, like a thunderstorm rolling in during a race or a fall at mile 9 that prevents you from finishing. But barring unforeseen disasters, using these questions to analyze the situation can help you move forward. They can also help you during a race. When you can be present and focused in a race, you will find yourself thinking about how all these pieces need to fall in place. The best race plans are adaptable, the best athletes know what needs to be done to execute even on the worst days. What we gain on our toughest days is experience – the ultimate teacher for future success. The post The 5 Questions You Should Ask Yourself After a Bad Race appeared first on TrainingPeaks. If you’ve recently signed up for a bike tour, stage race, or other multi-day cycling event you might be unsure about how best to prepare. In this post we’ll lay out a clear training strategy to make sure you arrive with fresh legs and the fitness to propel you to a strong finish. How many days will you be riding? What’s the longest block of back-to-back riding? What’s the distance/expected duration of each day including elevation gain/loss? Is there a “queen stage” you’ll want to prepare for differently? What’s the typical temperature range on your rides? How about the starting elevation? Take these answers and construct a picture of exactly what your tour entails. 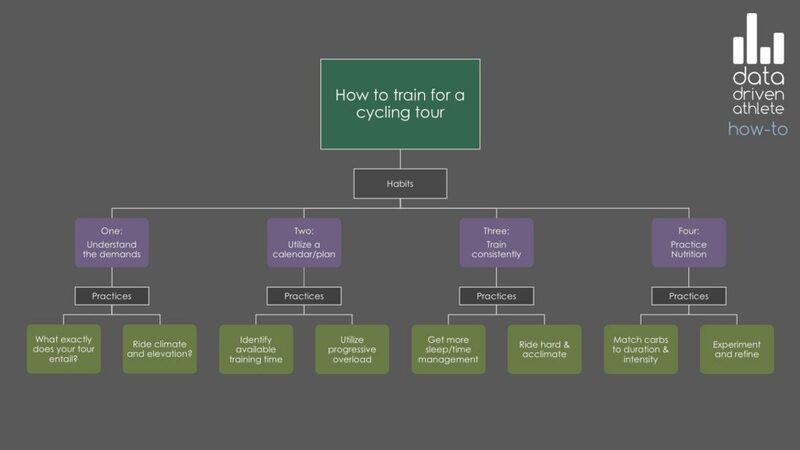 The more details you collect, the more closely you’ll be able to align your training plan with the demands of your tour. Improve your time management. The better you are at managing your time, the more likely you’ll be to make every rides. Getting Things Done, by David Allen, presents a simple and intuitive system that can transform how you manage your time. Essentially, you’ll want to plan well ahead and commit to spending time on your training. When you can’t go long, go hard. Yes, slower Zone 2 type rides will improve your fitness , but if you’re crunched for time there’s no better way to improve all facets of your cycling than high intensity training . Think you don’t have enough time to train?Even just a focused 10-minute ride (including warmup and cool down) can help keep you on track . Start by entering the event date in your TP account. Check out this short tutorial for extra help. 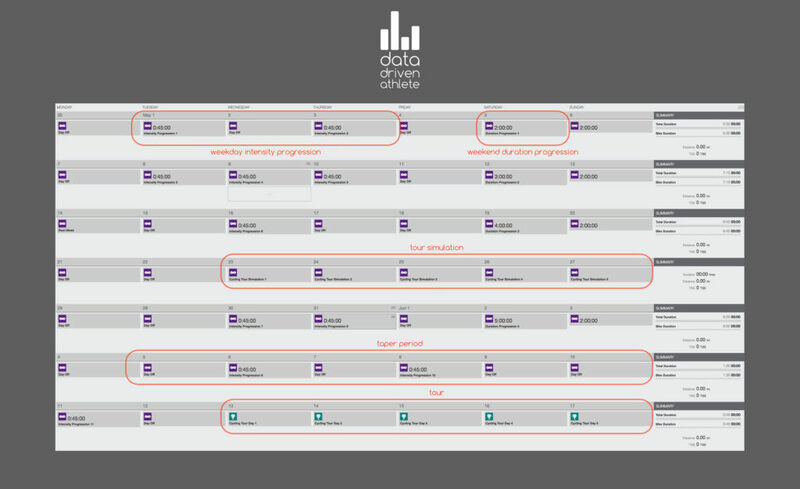 Enter your available training time for each day of the week. Check out this short tutorial for extra help. If you’re crunched for time, your training focus should be progressively riding with more intensity, or riding intensely for progressively longer durations. On the other hand, if your ride schedule is wide open, your progression should have a blend of intensity and distance/duration (often referred to as volume). 3-4 weeks before your start, try to string together a series of rides similar in volume/intensity to your tour. Again, if you can’t fit in longer rides, focus instead on nailing high intensity workouts in a sequence similar to your tour (see graphic below). In the final 1-2 weeks (taper period) before your multi-day cycling event, remember to reduce your overall training volume (to shed residual fatigue) while maintaining training intensity (to maintain or slightly improve fitness) . 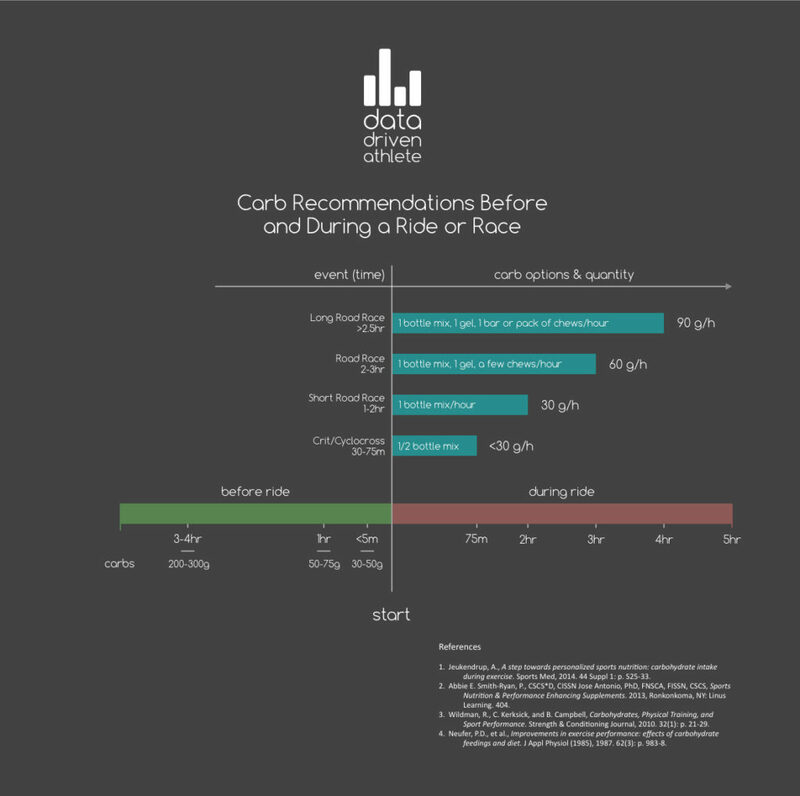 Match your carbohydrate intake to the duration and intensity of your ride . To take a deeper look at fueling for an event, please check out this article. For a quick snap shot check out the graphic below. Check out this article for an in-depth look at developing your own hydration strategy for a multi-day cycling event. If you’re looking for a single piece of advice, make sure to start your ride fully hydrated, then drink to thirst . Before you experiment with a new fueling strategy, make sure you’re regularly practicing your nutrition in the lead up to your tour. The gut, just like other working muscle, is trainable [10, 12]. The more you practice your fueling strategy in advance, the better you’ll be on event day. Fueling for the next ride in your tour starts as soon as soon as you’re finished with the ride for the day. For long multi-day tours a high carbohydrate approach (≈10g/kg body mass/day) is essential . Make sure you have plenty of supplementary carbs on hand (my favorite is a pot of rice) to fill in the cracks if you’re still hungry after or between meals. Acclimate to the environment. If your cycling tour is taking place in a warmer climate or at higher elevation, try overdressing on rides [6, 7] or taking a hot bath immediately after rides  every 3 days for 10-14 days before your tour. Acclimating to heat in advance of your tour is a great strategy to make sure you’re prepared for hot weather or higher elevation . Get more sleep. A recent study showed those who slept under 5 hours a night were over 4 times more likely to catch a cold than those sleeping more than 7 hours a night . If you expect to be healthy enough to stay on the bike, start by getting more sleep. With a bit of planning and hard work you should be well on your way to enjoying the best multi-day cycling event of your life! The post How to Train For a Multi-Day Cycling Event appeared first on TrainingPeaks. 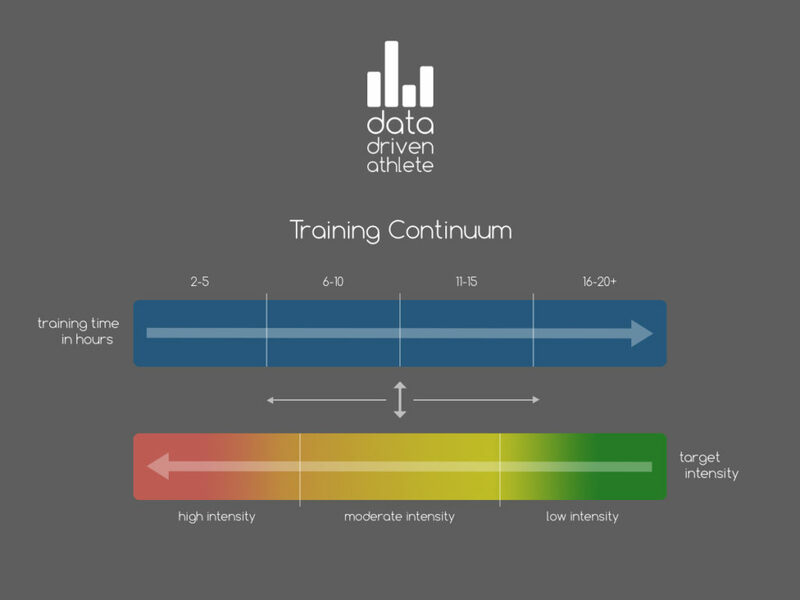 As part of the partnership between the Global Triathlon Network (GTN) and TrainingPeaks, we’ll be bringing you regular episodes of the new “Triathlon Training Explained” show. Hosts and former pro triathletes Mark Threlfall and Heather Fell will answer your triathlon training questions, with the help of TrainingPeaks software, coaches and industry experts from around the world. Whether you are looking to win your age group in an IRONMAN 70.3 or to simply cross the finish line of your first IRONMAN, bike pacing is an integral part to any race day. As the longest leg of a triathlon, it’s especially crucial to determine just how much energy output you should be expending. Once you enter T2 you want to have the stamina to hit a certain run pace consistently. In the latest episode of “Triathlon Training Explained,” Heather Fell and Mark Threlfall conduct their own pacing experiments on an evenly-paced time trial, followed by another time trial effort where they go hard right out of the gate, with lots of surges thrown in throughout. By analyzing TrainingPeaks metrics including Normalized Power® and Variability Index® they were able to determine their optimal pacing strategies. Fell and Threlfall also spoke with Best Bike Split and TrainingPeaks Chief Scientist Ryan Cooper about how triathletes can use Best Bike Split to predict their bike split times and help them dial-in their race specificity training for an optimal triathlon performance. 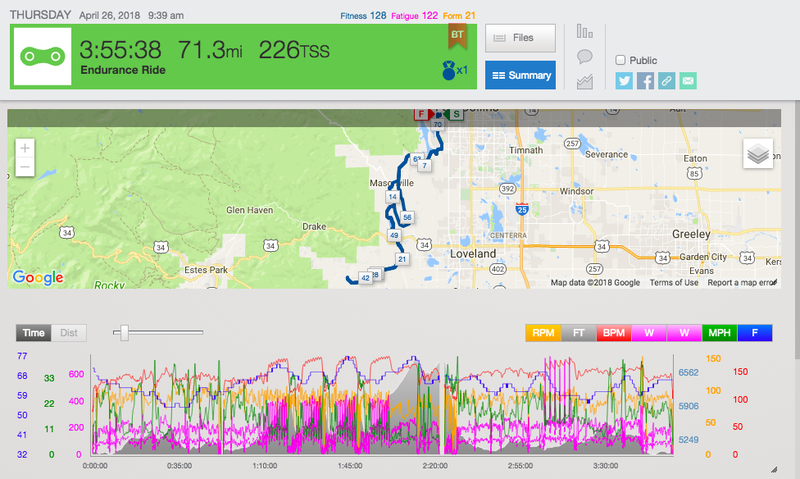 Triathletes in the know use TrainingPeaks to help plan, track and analyze their training. Get dialed-in with a free 7-day Premium Trial today! The post GTN Presents: Bike Pacing for a Triathlon appeared first on TrainingPeaks.